Extraordinary Measures Today, a Financial Funeral Tomorrow - I wish I was referring to Fannie and Freddie in the title of this piece, but because those institutions are being resurrected, the funeral I am waiting for is the one for our entire fiat-based system. We are now on the brink of a collapse in confidence that brings the whole world financial system to its knees. Each market intervening action is becoming more extraordinary. The rallies which pull the suckers in following the intervening actions are becoming briefer and less powerful. I expect this one to be no different. This sequence has now become a broken record. Markets threaten to take out technical support levels and the government comes to the rescue. Armageddon is avoided until another day and a relief rally ensues on the belief that the government has fixed the problem a new bull market can begin. After all, this is how investors have been conditioned over the last three decades. Look out below. You could make the case that the S&P 500 will decline all the way back to 500 before being rescued by technical support. After the moves to restructure Fannie/Freddie, it should be clear to all, that there are no limits to which the government officials will go to prevent a collapse (and for politicians to keep their jobs). The only reasonable conclusion is that we will one day arrive at a point where government action is not enough, and when it does, the magnitude of the collapse will be far worse than what it would have been if we allowed it to occur earlier. We need to let this beast die as I wrote in " It's Always Darkest Before the Dawn...of a Depression ." We have strayed too far off course and there will be no avoidance of catastrophe at this point. We are just too far extended now. The decision to save Freddie and Fannie was totally expected. 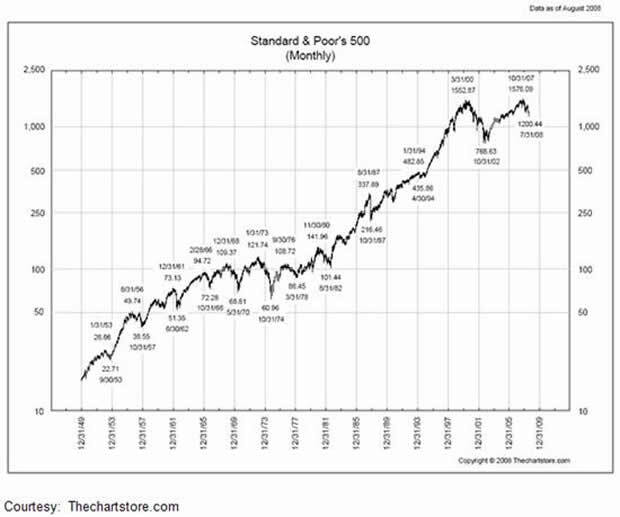 The third and final leg on our path to collapse (first initiated by the creation of the Federal Reserve in 1913) was set in motion by our total abandonment of the gold standard in 1971 and is now only months, if not weeks away. Nixon gets the blame, but he was merely reflecting the collective will (or “non-will”) of the American people to exercise a little sacrifice and discipline and pay our national and international debts. See my piece titled, http://www.greenfaucet.com/the-market/debt-demographics-debasement-are-destiny. The price we will pay the piper will be catastrophic as a result. We became the most gluttonous nation in the history of the world. The image of that fat guy who ate so much that he exploded in that Monty Python movie comes to mind when I look for an analogy. Many have written that our children will be paying for the extravagance of the baby-boomers for the rest of their lives. I disagree. I now think that we are close to a reckoning event that will impose austerity, economic pain and suffering on the vast majority of Americans. This will be difficult to endure and could last a while. The US Government and consumers will be forced to make major adjustments. Lifestyle changes will be revolutionary. But on the positive side, it could restore some of the bedrock principles this country was founded, built, and thrived upon (thrift over profligacy, savings over consumption, and discipline over excess). This will hopefully place us back onto the path of responsibility and sustained growth. We should be able to refresh anew after the cleansing process which expunges the huge multi-year debt overhang. This will be painful and most government officials will fight it tooth and nail, pandering to the masses to prop up the current system, now clearly doomed to failure. This backdrop will prove to be treacherous for investors. I think we are now embarking in a period that will see financial convulsions between inflation and deflation. Battling between the two and trying to position for the correct scenario will rip most portfolios apart. If you are positioned for one while the other occurs, it destroys your capital base, leaving an investor with less to try to take advantage of the next swing. Since last August (2007), the correct bet was on the inflation trade. That trade changed on dime on July 15. Many incorrectly interpreted the dollar strengthening and rebound in deeply oversold sectors as a return a bull market for US equities. Wrong! This was a reversal of a very crowded trade as the winds of deflation began to displace inflationary forces. The reversal of the long commodities/short the dollar (and equities which benefit) was swift and brutal and continues today. As the dollar rose from under 71 (the end of March) to over 79 (now) over the summer we saw an across-the-board selloff in commodities and emerging market equities and a mini-counter-trend rally in the stinky US sectors (tech, financials, consumer discretionary) where investors had previously been losing their shirts. Government bonds also rallied indicating that this was a period in which you should have been invested for deflation. We are now approaching an important test for the US dollar is it approaches 80 again. The dollar has rallied up to 80 over the last couple of weeks (not quite shown on the chart above). 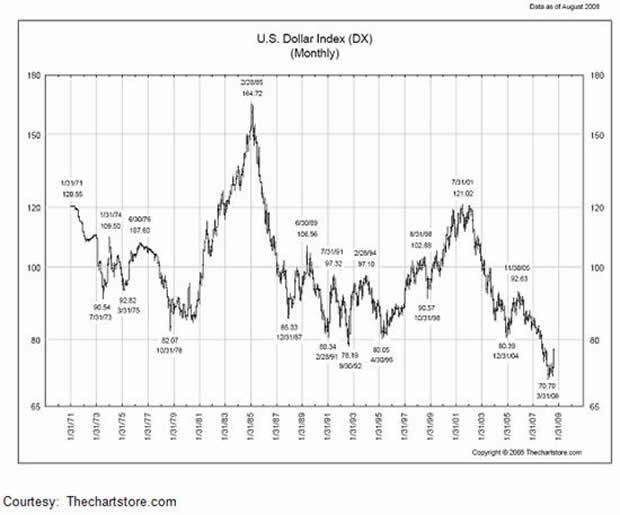 If the dollar does in fact rally above 80, then I think that the deflation trade will accelerate further and takedown US equities this time in a major whiff of asset deflation which takes down almost all asset classes except US treasuries. If it continues unabated it will result in a major deflationary depression. Gold will eventually rise in value amidst the chaos and removal of the paper currencies, but not after first declining significantly. If, on the other hand, the US dollar begins to decline back below the 74-73-level, I think that investors will need to consider repositioning for the inflation trade. While the dollar stays in the 75-80 range we can expect big gyrations, but little real movement or investment direction. In the inflationary environment, your best investment choices are energy and precious metals. If the dollar does move above 80, I view it highly likely that at some point before a deflationary depression occurs, governments and politicians around the world will massively debase their currencies and enact ultra-expansionary fiscal and monetary policies in order to fight it. Therefore, anyone with a one-way bet on deflation could be wiped out if we experience one or two highly-inflationary periods along the way. Planning for the unavoidable collapse of this beast of a fiat financial system we must now confront (the “Financial Funeral”) is thus fraught with danger as you try to navigate between seemingly wild and capricious swings between inflation and deflation. The only bet sure to fail is that the government actions will succeed in preventing the Financial Funeral from ever occurring.